Dazzling in scope, Ecstatic Nation illuminates one of the most dramatic and momentous chapters in America's past, when the country dreamed big, craved new lands and new freedom, and was bitterly divided over its great moral wrong: slavery. With a canvas of extraordinary characters, such as P. T. Barnum, Walt Whitman, Frederick Douglass, and L. C. Q. Lamar, Ecstatic Nation brilliantly balances cultural and political history: It's a riveting account of the sectional conflict that preceded the Civil War, and it astutely chronicles the complex aftermath of that war and Reconstruction, including the promise that women would share in a new definition of American citizenship. It takes us from photographic surveys of the Sierra Nevadas to the discovery of gold in the South Dakota hills, and it signals the painful, thrilling birth of modern America. 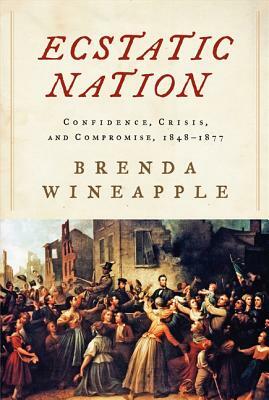 An epic tale by award-winning author Brenda Wineapple, Ecstatic Nation lyrically and with true originality captures the optimism, the failures, and the tragic exuberance of a renewed Republic. Brenda Wineapple is the prizewinning author of several books, including White Heat: The Friendship of Emily Dickinson and Thomas Wentworth Higginson, which was a finalist for the National Book Critics Circle Award and a New York Times Notable Book. She lives in New York City. — Publishers Weekly, starred review, "Review of the Week"